And other meat processing tools. All products POLKARS are made from top-class German high carbon stainless steel. In the offer there is available chrome-molybdenum steel, which has the ability to increase the limits creep resistance, hardenability and reduced brittleness or chrome-molybdenum-vanadium, which is characterized by high elasticity, resistance to abrasion and cracking. All products are subjected to specjalist heat treatment for optimized hardness of 55 HRC-57HRC. Our knives handles are ergonomically designed to fit any hand. They are made from wood or polypropylene. Available in different types and colors. 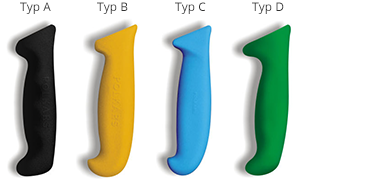 Standard handle colors: black, blue, yellow, red, orange. On special order any handle color can be made.